Home»Home»FAQs»How do I change my password? From the Catalog > click on My Account > log in using your 14-digit library card number (with no spaces) and password (a minimum 4 digits). 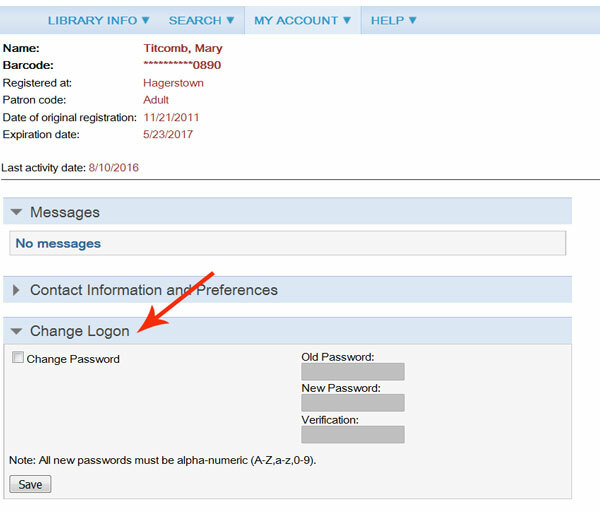 After logging in, click "Change Logon" at the bottom of your account screen. Check mark the "Change Password" box, then enter your old password, new password, then your new password again in the verification box. Click "save" to update your new password. If you do not know your password you can reset by using the "Forgot your password" link and entering your barcode. An email will be sent to the email on file for your account. If you do not know your barcode or the email associated with your card has changed, please contact your local branch.